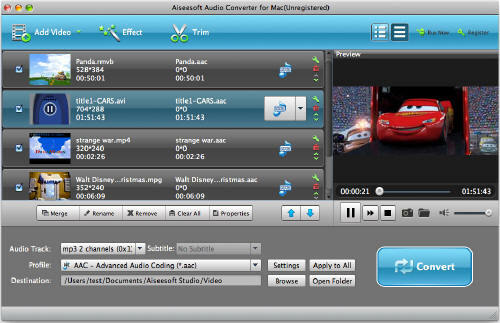 Video to Audio Converter for Mac can extract the audio track from your video files to popular audio formats such as MP3, WAV, AAC, AC3, M4A, etc with high sound quality. It is a very practical tool for Mac users. It can convert MPEG to MP3 and RM to MP3, and so on. This Mac Video to Audio Converter provides you with very useful features such as batch conversion, trim audio, and merging added files into one file. Convert your video audio to all sorts of audio formats for your music players with Video to Audio Converter for Mac! Extract from RM to MP3, from MPEG to MP3 and from lots of other video formats to audio. Convert all popular video formats to MP3, WAV, AAC, AC3, OGG, APE, M4A, etc. You can extact audio from only a part of the video file by trimming. Set output settings including sample rate, channel, encoder and bit rate. Merge all imported audio files into one file. Video to Audio Converter for lets you convert video to various audio formats on Mac OS X with zero learning curve. Why choose Video to Audio Converter for Mac?